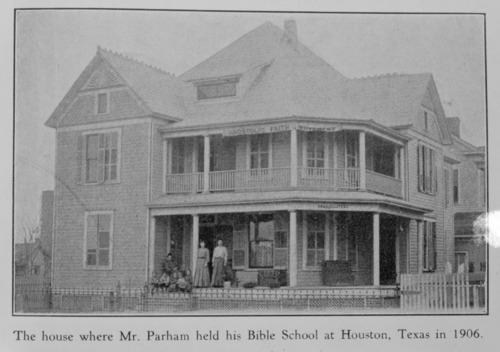 This is a photograph showing the house where Charles Fox Parham held his Bible school in Houston, Texas. Parham was the central figure in the development of the Pentecostal faith. He moved to Kansas with his family as a child. As an adult, his religious activities were headquartered in Topeka, Kansas. The photograph was copied from The Life of Charles F. Parham Founder of the Apostolic Faith Movement by Sarah E. Parham.